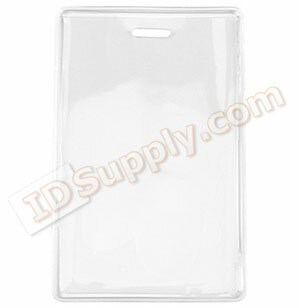 HP80A-V Vertical Anti-Print Transfer Proximity Badge Holder. These data/credit card size, clear vinyl holders are made with an anti-print transfer material to prevent ID imprint from sticking to front of holder in extreme temperatures. Standard slot and chain holes allow for easy attachment to any badge reel, lanyard or chain. Max Insert: 2.38" x 3.75"